There is no cross-reactivity with other neurospecific proteins. This clone has been derived from hybridization of Sp2/0 myeloma cells with spleen cells of Balb/c mice immunised with purified glial fibrillary acidic protein from human brain. 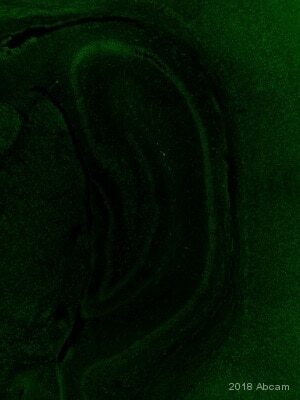 normal adult rat brain: lateral ventricle IHC-P: FFPE human hippocampus normal. 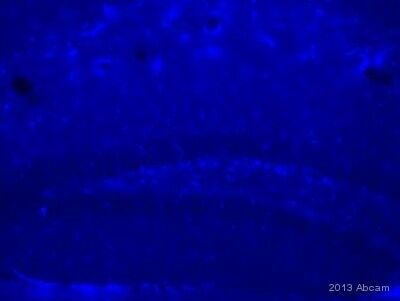 IHC-P: FFPE rat brain normal. Shipped at 4°C. Upon delivery aliquot. Store at +4°C. Do Not Freeze. Our Abpromise guarantee covers the use of ab10062 in the following tested applications. WB Use a concentration of 1 - 5 µg/ml. Detects a band of approximately 43-45 kDa. Expressed in cells lacking fibronectin. Defects in GFAP are a cause of Alexander disease (ALEXD) [MIM:203450]. Alexander disease is a rare disorder of the central nervous system. It is a progressive leukoencephalopathy whose hallmark is the widespread accumulation of Rosenthal fibers which are cytoplasmic inclusions in astrocytes. The most common form affects infants and young children, and is characterized by progressive failure of central myelination, usually leading to death usually within the first decade. Infants with Alexander disease develop a leukoencephalopathy with macrocephaly, seizures, and psychomotor retardation. Patients with juvenile or adult forms typically experience ataxia, bulbar signs and spasticity, and a more slowly progressive course. Cytoplasm. Associated with intermediate filaments. 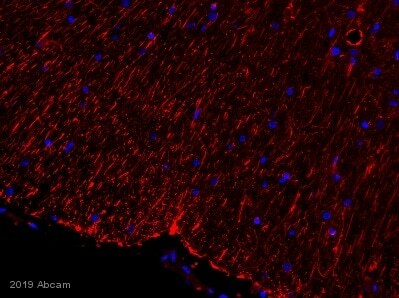 IHC image of GFAP staining in a formalin fixed, paraffin embedded rat normal brain tissue section, performed on a Leica Bond™ system using the standard protocol F. The section was pre-treated using heat mediated antigen retrieval with sodium citrate buffer (pH6, epitope retrieval solution 1) for 20 mins. The section was then incubated with ab10062 at 1/100 dilution for 15 mins at room temperature and detected using an HRP conjugated compact polymer system. DAB was used as the chromogen. The section was then counterstained with haematoxylin and mounted with DPX. Mouse monoclonal to GFAP [GF5] (ab10062) was used in fixed murine cultures (mixed neurons/glia) at 1/100 overnight at 4°C. 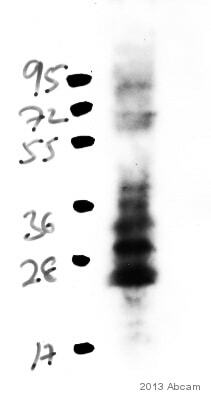 A secondary goat anti-mouse antibody was used for detection (Alexa Fluor 568; 1/400). Microscopy revealed diffuse cytosolic labelling. Coounterstaining with TO-PRO-3 (Molecular Probes; 660nm (converted here to blue colour) was used to identify the nucleus. The “fibrous” anti-GFAP staining of murine mixed cultures is typical of what is expected. Overlay histogram showing SH-SY5Y cells stained with ab10062 (red line). The cells were fixed with 80% methanol (5 min) and then permeabilized with 0.1% PBS-Tween for 20 min. The cells were then incubated in 1x PBS / 10% normal goat serum / 0.3M glycine to block non-specific protein-protein interactions followed by the antibody (ab10062, 1µg/1x106 cells) for 30 min at 22ºC. The secondary antibody used was DyLight® 488 goat anti-mouse IgG (H+L) (ab96879) at 1/500 dilution for 30 min at 22ºC. Isotype control antibody (black line) was mouse IgG2b [PLPV219] (ab91366, 2µg/1x106 cells) used under the same conditions. Acquisition of >5,000 events was performed. This antibody gave a positive signal in SH-SY5Y cells fixed with 4% paraformaldehyde (10 min)/permeabilized with 0.1% PBS-Tween for 20 min used under the same conditions. 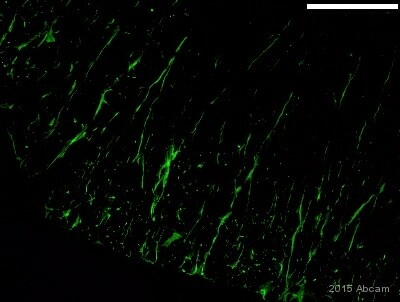 IHC image of GFAP staining in a formalin fixed, paraffin embedded human normal hippocampus tissue section, performed on a Leica Bond™ system using the standard protocol F. The section was pre-treated using heat mediated antigen retrieval with sodium citrate buffer (pH6, epitope retrieval solution 1) for 20 mins. The section was then incubated with ab10062 at 1/500 dilution for 15 mins at room temperature and detected using an HRP conjugated compact polymer system. DAB was used as the chromogen. The section was then counterstained with haematoxylin and mounted with DPX. 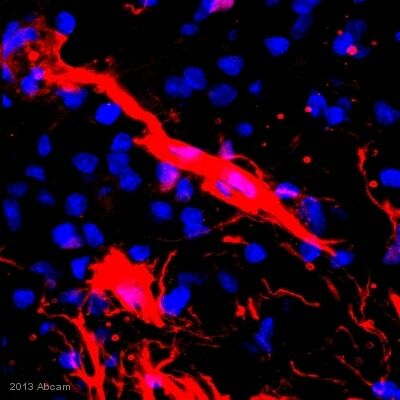 GFAP antibody [GF5] - Astrocyte Marker (ab10062) immunocytochemical detection in stimulated Cor1 cells. Stimulated Cor1 cells were fixed in formaldehyde, permeabilized, blocked in 1% BSA for 10 mins @ rt°C. Primary Antibody ab10062 incubated at 1/1500 for 2 hours in TBS/BSA/azide/0.3% triton. 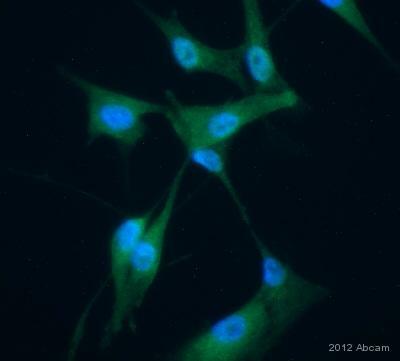 Secondary Antibody: anti mouse IgG Conjugated to: Alexa Fluor® 488 (1/1000). 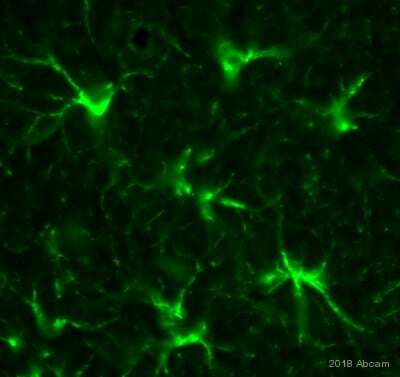 GFAP antibody [GF5] - Astrocyte Marker (ab10062; 1/250 for 16h) used in Immunohistochemistry (Formalin/PFA-fixed paraffin-embedded sections) on Rat Tissue sections (adult brain: lateral ventricle showing astrocytes).Antigen retrieval step: Heat mediated. Blocking step: 1% BSA for 10 mins at RT. Secondary Antibody: biotin labelled goat anti mouse Ig (1/200). This image shows the exit point for the progenitor olfactory neurones, of the lateral ventrical subventricular zone. Mouse monoclonal to GFAP [GF5] (ab10062) was used in fixed rat glial cultures at a dilution of 1/100, and incubated overnight at 4°C. Alexa Fluor 568 (1/400) secondary goat anti-mouse antibody was used for detection. Fluoresence microscopy revealed diffuse cytosolic labelling. Counterstaining with TO-PRO-3 (Molecular Probes; 660nm (converted here to blue colour) was used to identify the nucleus. The “fibrous” anti-GFAP staining of murine mixed cultures is typical of what is expected. Publishing research using ab10062? Please let us know so that we can cite the reference in this datasheet.